I never tried roasting chickens before, but there's always a first time. Mom and I was watching Better Homes and Gardens yesterday, and "Fast" Ed Halmagyi cooked up this roast chicken. I go, "I can do that", so here we are. Stuff all of the above into the chicken, if you can manage it. Starting from the neck, peal away a portion of the skin from the chicken breast. Cut some slices of butter and slide them between the skin and the breast. Pre-heat the oven to 200 degrees. 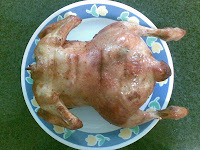 Place chicken on a wire mesh and leave in oven for 45 minutes to an hour.